The notable dark black-purple color suggests a concentrated and ripe vintage. With perfume-scented blueberries, cassis, cherries, raspberries and dried lavender, the nose is enticing. There is also wonderful oak and fruit integration displaying notes of cassis, red plums, tart cherries, cocoa nibs, cedar and Herbs de Provence. Mouthwatering ripe tannins give way to a long and dramatic finish reinforcing a rich and complete D2 that will give satisfaction for years to come. 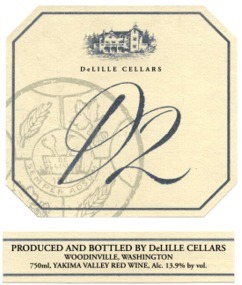 Founded in 1992, DeLille Cellars is a small family owned winery located in Woodinville, Washington. Their goal is to make the very best handcrafted, old-world style red and white wine made in the State of Washington. The beautiful ten-acre site sits above the Woodinville valley floor, overlooking the wineries of Chateau Ste. Michelle and Columbia Winery. All DeLille wines are elaborated with the highest “hand-crafted” standards. Only grapes from the oldest and best vineyards in Washington State are used. They are hand picked and hand sorted at crush, using only the finest berry clusters. The wines are aged in 100% new French oak barrels each and every year and are never filtered. "Winemaker-vineyard manager and self-styled "old world traditionalist" Chris Upchurch has been the guiding spirit of DeLille Cellars since its early-’90s inception, although the ostensibly Old World models followed have evolved significantly in both marketing and winemaking terms. Early-on, DeLille, unsurprisingly, – like so many other U.S. wineries – focused exclusively on a Bordelais vision. That said, Upchurch and his partners had been in business for nearly a decade before they purchased a vineyard: Grand Ciel, adjacent to Ciel du Cheval and Galitzine and managed by the accomplished and (seemingly in Red Mountain at least) ubiquitous Ryan Johnson. DeLille also vinifies and bottles separately the fruit of Harrison Hill’s antique vines (for more about which see my tasting note on the 2009 vintage) and a second estate vineyard project is afoot. The established if misleading name Chaleur Estate was retained for DeLille’s flagship wine crafted from contract fruit (second wine: D2); while the designation Doyenne – utilized from early-on for Syrah – morphed into an officially separate winery for experimental-minded exploration of themes inspired by Southern France. (For database purposes, we at The Wine Advocate / eRobertParker.com treat Doyenne as part of the relevant wines’ descriptions and a DeLille sub-label, which reflects the way those wines are marketed and the spirit in which they were presented to me. Comments on Upchurch’s vinificatory approaches can be found sprinkled though my tasting notes.)"